L&T India Value Fund has a strict value orientation, which Venugopal believes will help the fund deliver long term value despite the near term performance hiccup the fund is experiencing. Remaining true to label, the fund has stayed away from expensive stocks that have become more expensive in this year’s flight to quality. 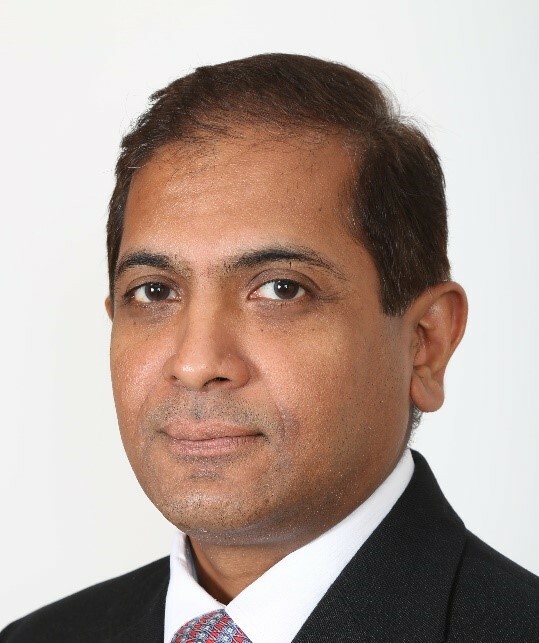 Venugopal believes the recent correction in mid and small caps has now opened up value opportunities in the broad market, which he is utilizing to gear the portfolio for long term outperformance. WF: While your fund has a very impressive long-term top quartile track record, the last 6 months seem to have been rough, relative to market and peers. What has caused the dip in performance and what steps are you taking to get performance back on track? Venugopal Manghat: In this calendar year, the market has become extremely risk averse which meant that investors pulled out money from stocks within the universe that were performing well and moved money into high quality predictable growth stocks despite their rich valuation. Since the fund has a strict value orientation and therefore, a strong focus on valuation, it did not participate in this move. Hence, on both counts, one due to the correction in the stock prices of some of the holdings and two, the lack of high quality, expensive stocks in the portfolio, it suffered. These are phases in the market and in the long run, such skewness will get evened out. Steps are being undertaken to achieve best balance in portfolio orientation over the short term without losing the value. The category is also new (post the reclassification of schemes) and many of the competing funds have had a different past and have never had a strict value orientation. WF: While the fund has a sizeable giant / large cap (34.56% + 17.24%) exposure, the exposure here is still lower than the benchmark (66.63% + 20.88%). Why are you overweight midcaps, especially in the context of the severe correction in that space? Venugopal Manghat: Over the last 12 months, there has been a conscious effort to increase the exposure in the large cap space given the valuation differential and the increase in size of the fund. Having said that, over a longer time horizon, given the stage of evolution of Indian economy and market, mid and small cap stocks are likely to outperform. Now that there has been a significant correction in the mid and small cap space, the broad market is offering good value opportunities. WF: You are considerably overweight on construction and real estate (10%) against the benchmark (5.88%) – what is the rationale for this significantly positive stance? Venugopal Manghat: The fund has a small exposure to the pure construction sector. Construction has been one of the key areas of growth within industry and one of the key drivers of the economy especially with the government’s focus on the public infrastructure building, like roads, railways, metros, irrigation projects etc. The fund is overweight in the real estate space given the new regulations that have come into force and the shift in market share from unorganized to the organized players. WF: Over the next 12 months, which sectors do you see strong earnings momentum and how comfortable are you with current valuations in these? Venugopal Manghat: For the next 12 months, both private and select public sector banks are likely to do well in terms of earnings growth. On a year on year basis, metals, construction, real estate etc. continue to show improvement. IT sector could see marginal improvement in the earnings growth as also the FMCG space through higher volume growth, given a wash out base quarter. While in general, valuations have corrected, the FMCG sector and to a large extent most consumer franchises are quite expensive at this point. Also, the pharmaceutical sector is factoring in potential medium term growth already. WF: In what way are you positioning your fund to deal with the significant increase in market volatility that we are witnessing this calendar year? Venugopal Manghat: The fund is a good mix of large, mid and small cap stocks. Within this mix, we are trying to balance the portfolio with sectors and stocks that we were hitherto very underweight. Also, we are constantly looking for good value and feel that such market corrections give opportunities on a bottom up basis. WF: Is the current bout of volatility and the significant correction in mid and small caps a signal that value as a style may outperform growth over the medium term? Venugopal Manghat: It is very difficult to say what style works in short periods of time and to my mind a futile exercise, as we are investors for the long term. However, it is true that the market correction is giving significant opportunities in the mid and small cap space which makes me believe that returns could be better over a three to five year time horizon. L&T Business Cycles Fund - Regular Plan, *Name of the Benchmark -S&P BSE 200 TRI Index, Scheme Inception date is August 20, 2014. Mr. Venugopal Manghat and Mr. Karan Desai have been managing this fund. L&T India Large Cap Fund - Regular Plan, *Name of the Benchmark -S&P BSE 100 TRI Index, Scheme Inception date is October 23, 2007. Mr. Venugopal Manghat and Mr. Karan Desai have been managing this fund. 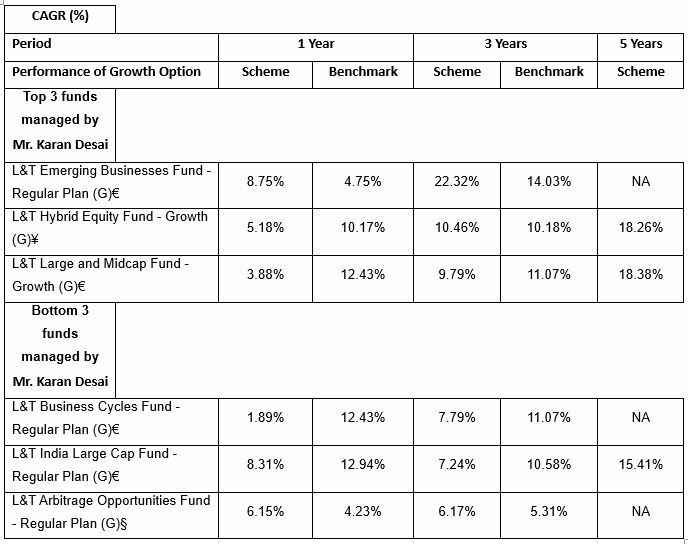 L&T Equity Savings Fund - Regular Plan, *Name of the Benchmark -Nifty 50 Arbitrage (75%) + S&P BSE 200 TRI (25%), Scheme Inception date is October 18, 2011. Mr. Venugopal Manghat, Mr. Praveen Ayathan and Mr. Jalpan Shah have been managing this fund. L&T Conservative Hybrid Fund - Regular Plan, *Name of the Benchmark -CRISIL Hybrid 85+15 - Conservative Index, Scheme Inception date is July 31, 2003. Mr. Jalpan Shah and Mr. Venugopal Manghat have been managing this fund. L&T Arbitrage Opportunities Fund - Regular Plan, *Name of the Benchmark - Nifty 50 Arbitrage Index, Scheme Inception date is June 30, 2014. Mr. Venugopal Manghat, Mr. Praveen Ayathan and Mr. Karan Desai have been managing this fund. Different plans have different expense structure. The performance details provided herein are of regular plan ^Past performance may or may not be sustained in future. *All payouts during the period have been reinvested in the units of the scheme at the then prevailing NAV. Returns > = 1 year: CAGR (Compounded Annualised Growth Rate). N.A stands for data not available. Source: ICRA MFI Explorer. We are comparing the performances of the funds with the total return Index. L&T Emerging Businesses Fund - Regular Plan, *Name of the Benchmark -S&P BSE Small Cap TRI Index, Scheme Inception date is May 12, 2014. Mr. S.N. Lahiri and Mr. Karan Desai have been managing this fund. 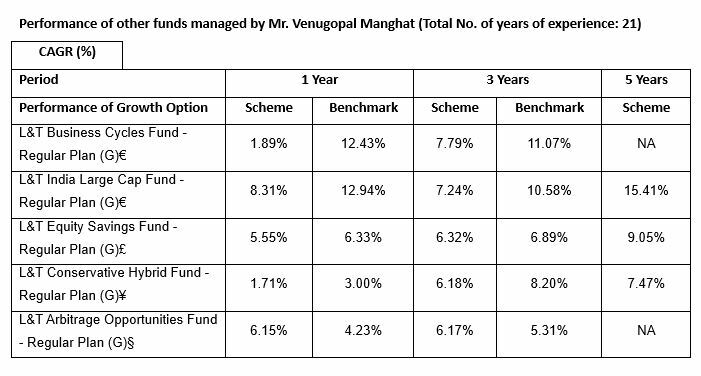 L&T Hybrid Equity Fund - Growth, *Name of the Benchmark -70% - S&P BSE 200 TRI Index and 30% - CRISIL Short Term Bond Fund Index, Scheme Inception date is February 07, 2011. Mr. S.N. Lahiri, Mr. Shriram Ramanathan and Mr. Karan Desai have been managing this fund. L&T Large and Midcap Fund - Growth, *Name of the Benchmark -S&P BSE 200 TRI Index, Scheme Inception date is May 22, 2006. Mr. S.N. Lahiri and Mr. Karan Desai have been managing this fund. L&T Business Cycles Fund - Regular Plan, *Name of the Benchmark -S&P BSE 200 TRI Index, Scheme Inception date is August 20, 2014. Mr. Venugopal Manghat and Mr. Karan Desai have been managing this fund. L&T India Large Cap Fund - Regular Plan, *Name of the Benchmark -S&P BSE 100 TRI Index, Scheme Inception date is October 23, 2007. Mr. Venugopal Manghat and Mr. Karan Desai have been managing this fund. Disclaimer: "This document is for general information only and does not have regard to specific investment objectives, financial situation and the particular needs of any specific person who may receive this information. This document provides general information on performance; financial planning and/or comparisons made are only for illustration purposes. The data/information used/disclosed in this document is only for information purposes and not guaranteeing / indicating any returns. This material provides general information and comparisons made (if any) are only for illustration purposes. Investments in mutual funds and secondary markets inherently involve risks and recipient should consult their legal, tax and financial advisors before investing. Recipient of this document should understand that statements made herein regarding future prospects may not be realized. Recipient should also understand that any reference to the indices/ sectors/ securities/ schemes etc. in the document is only for illustration purpose and should not be considered as recommendation(s) from the author or L&T Investment Management Limited, the asset management company of L&T Mutual Fund or any of its associates. Recipient of this information should understand that statements made herein regarding future prospects may not be realized or achieved. Neither this document nor the units of L&T Mutual Fund have been registered in any jurisdiction except India. The distribution of this document in certain jurisdictions may be restricted or totally prohibited and accordingly, persons who come into possession of this document are required to inform themselves about, and to observe, any such restrictions".